Last night I went to a networking event. Let's just say, I've been to better. 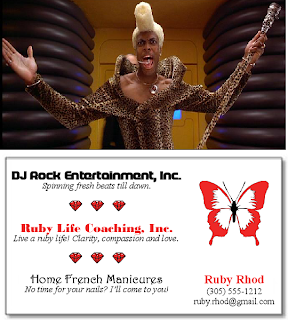 The one person that really stood out however, was a young lady who reminded me of Ruby Rhod, Chris Tucker's character from The Fifth Element. I wish I could tell you some lurid story. 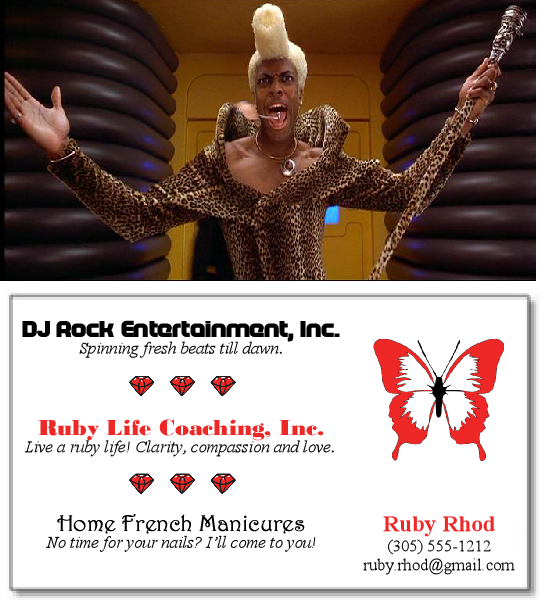 In fact, what stood out most about Ruby (besides the hair) was her business card. I have reproduced it here for you. I stayed true to the original design but I changed all the names, to protect the innocent. Now, before you think that I am making fun of her behind her back -- I am not! Everything I am about tell you, I told her first. As my readers know, I am happy to help out any entrepreneur. And while I am a marketing idiot, there are some simple things even I understand. Never, ever, ever list multiple businesses on one card, especially when those businesses are in different industries. It makes you look like a jerk-of-all-trades, and that is not a good thing. There's nothing wrong with having plenty of irons on the fire. Trust me. I have plenty myself. Diversification is a smart strategy and it never hurts to have multiple streams of income. But when your business card lists three business names in three different industries then you come across as a Mickey Mouse operation. And no, that is not a compliment. You're too cheap/broke to pay for multiple business cards. You are not a real expert in the field -- you're a dabbler. Like I said before, there's nothing wrong with multiple lines of business. But I don't need a life coach who can give me pedicure while spinning funky, fresh beats.